First of all, I wanted to say that you are doing a fantastic job with this tool! I found it very easy to jump right in and create my garden layout today. The harvest and log tabs are handy additions to the layout tool as well. 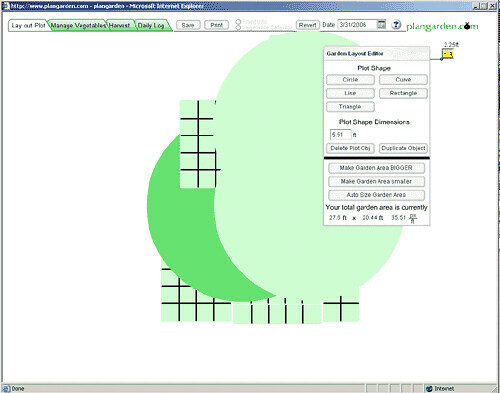 Now for the bug--I've noticed that when I include circles in my layout either alone or with rectangle shapes, autofitting the area and then increasing the garden size again will often cause some or all of the circles to blow up in size by very large increments. The circles are often large enough to cover all of the other elements on the screen. I saw this a while back, but only saw it when I put circles alone. I tested it again on Tuesday or Wednesdday and didn't see the problem. It was on my list, but I figured it was some corner case that no one but myself ever saw and not reproducible in real gardens. Now you have proven the gremlin exists in the real world and that people can see it. I will be using your garden as a test case in my lab and fix the problem. It will be fixed over over the weekend. I think I got it fixed. A very strange bug. Hard to explain why, but it was obvious to see once you set it up right and looked like there was no way to miss it, but I found several test cases where it didn't show up. To make a story that is getting long and a short ending. Shazam! I think you will find this fixed in 1.03. I want to do more testing, I have a sneaky suspicion there might be one or two more odd cases with circles and gardens.